Rancho Vista Boulevard (Avenue P) at the State Route 14 bridge, from 10th Street West to Country Club Lane. Intermittent lane closures for potholing, conduit installation and repairs. Thursday, Feb. 14, from 1 p.m. to 11 p.m., Lancaster Blvd. closed between Ehrlich Avenue and Fern Avenue. The area will be closed to traffic and parking for The BLVD Market. The Market, which takes place every Thursday, from 3 to 7 p.m., is an opportunity for the community to gather and enjoy an offering of fresh produce and unique items in an open market atmosphere. Beginning Feb. 11, lane closures at 10th Street West and Avenue I. Closures are due to Public Works Construction Project 17-012. The scope of work includes traffic signal modifications and pedestrian bulb outs, in addition to multiple utility and infrastructure improvements. The intersection of Lancaster Blvd. and 15th Street East will be closed to traffic through May 5, 2019. 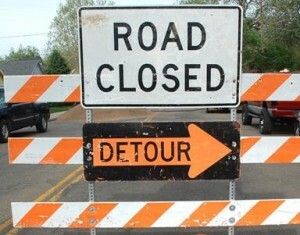 Closures are due to Public Works Construction Project 17-007, the Lancaster Blvd. and 15th Street East roundabout.Drivers are encouraged to use an alternate route. Through May 28, expect intermittent lane closures on 5th Street East, between Avenue H-8 and Avenue J-4. Closures are for sidewalk and street improvements related to Public Works Construction Project 17-009. Construction activity near Lancaster City Hall at the intersection of Kettering and Fern Avenue. Scope of work includes new bulb outs and pedestrian ramps (PWCP 17-020). Lane closures on Avenue K, between 32nd and 40th Street West. Closures are due to sidewalk, curb, and gutter repairs related to Public Works Construction Project 18-006. Sidewalk closures on Kildare Street, Gadsden Avenue, and Lancaster Blvd. near The BLVD Starbucks location. Closures are due to construction related to the Marriott Hotel development. 60th Street West may be closed to traffic, between Avenue J and the entrance to the California State Prison. Closures are due to private development storm drain improvements.